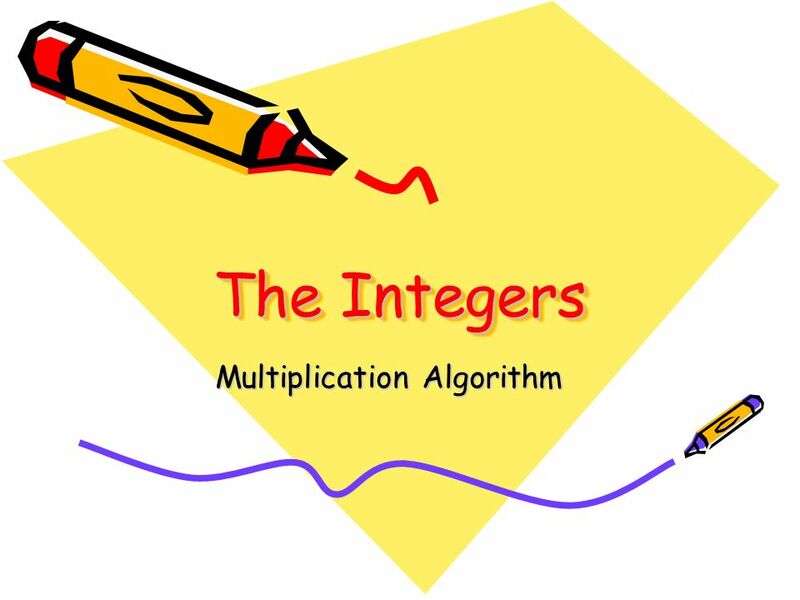 The Integers Multiplication Algorithm. 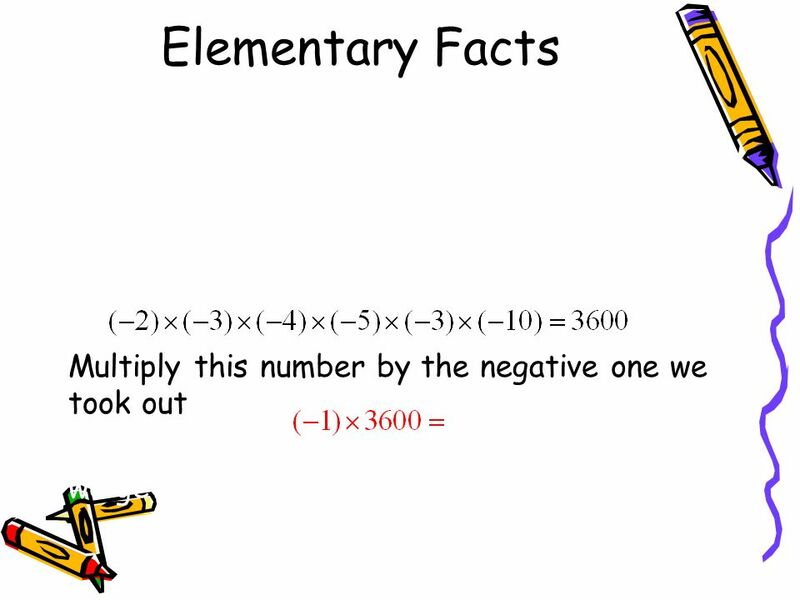 Elementary Facts Playing the MathGym-1D game you have seen three important facts: The product of two positive numbers. 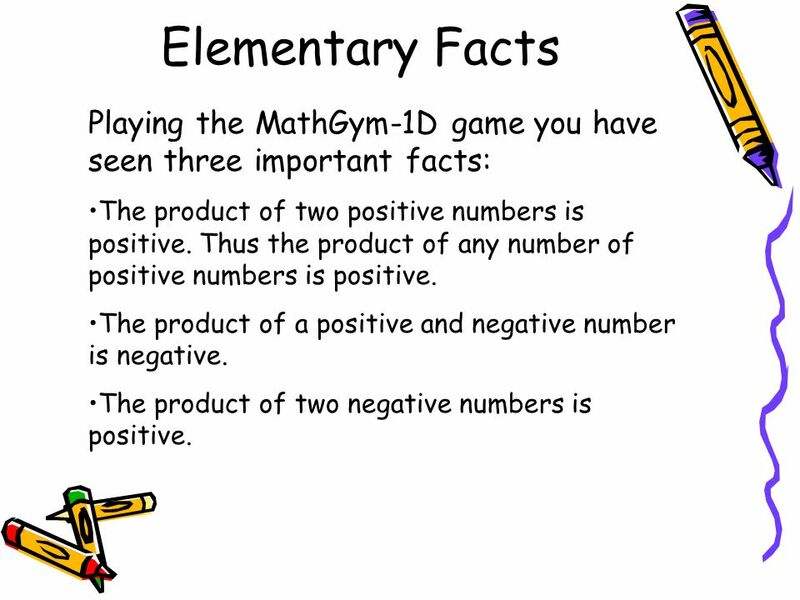 2 Elementary Facts Playing the MathGym-1D game you have seen three important facts: The product of two positive numbers is positive. Thus the product of any number of positive numbers is positive. 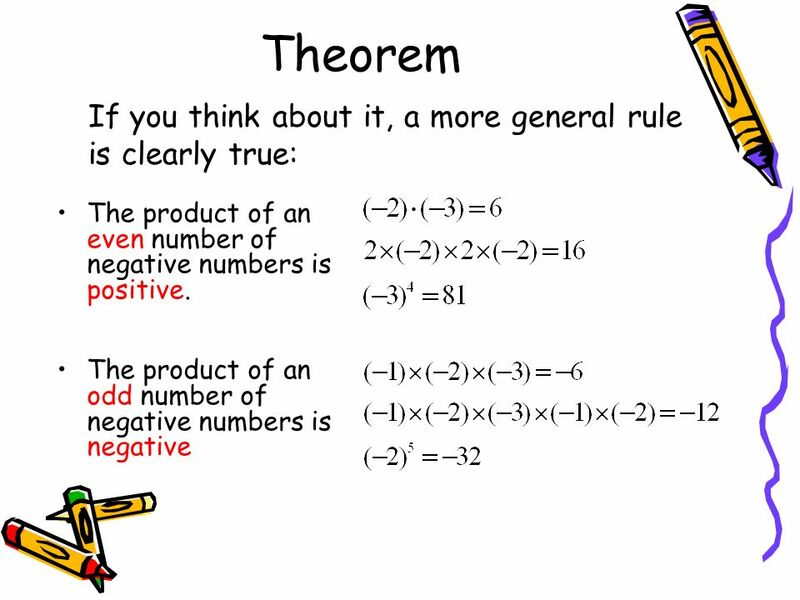 The product of a positive and negative number is negative. 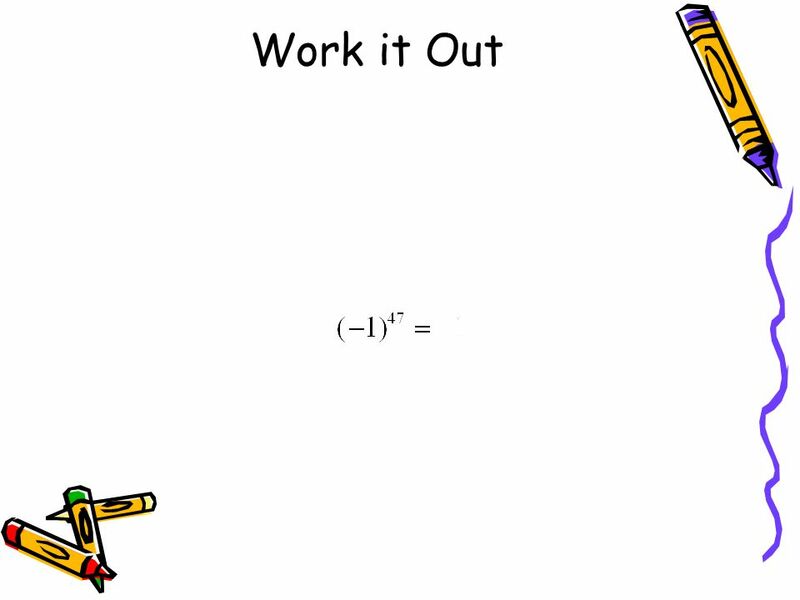 The product of two negative numbers is positive. 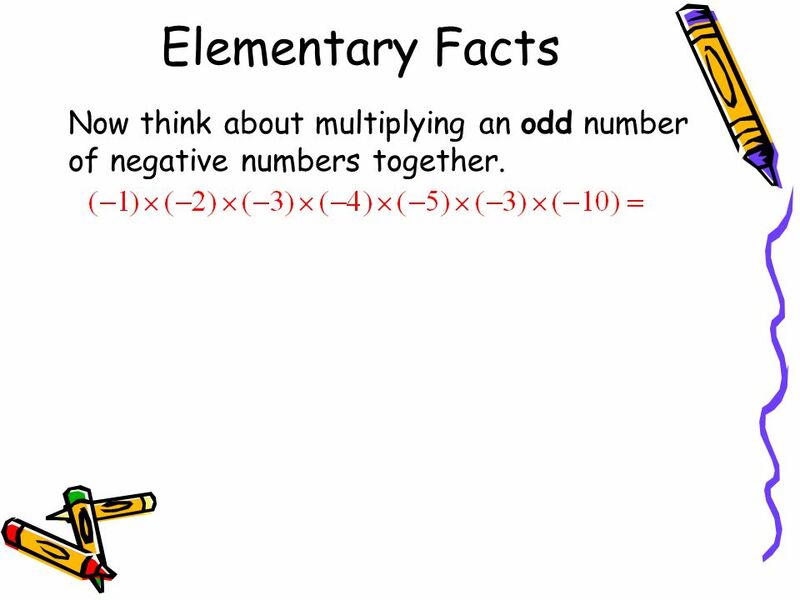 7 Now think about multiplying an odd number of negative numbers together. If we remove one negative number, the remaining even product must be positive! Multiply this number by the one we took out we get a negative product! 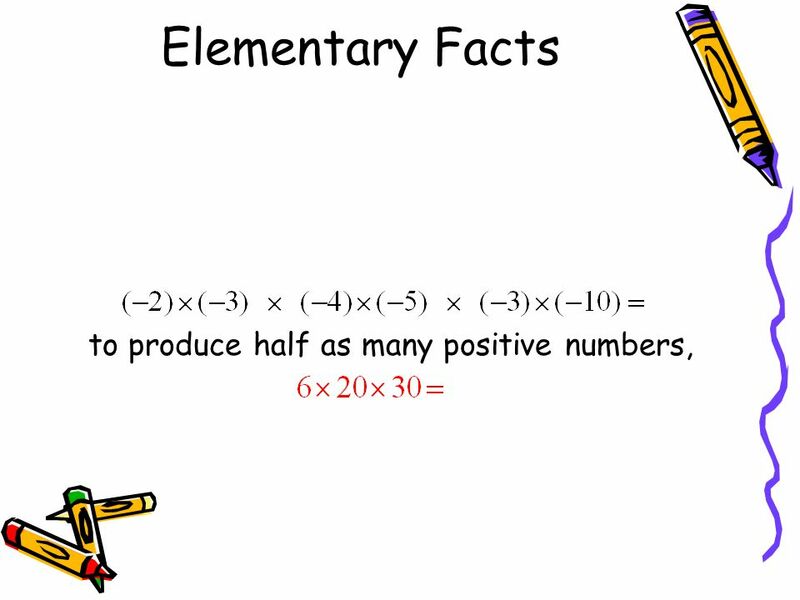 8 Elementary Facts Now think about multiplying an odd number of negative numbers together. If we remove the first number, the remaining even product must be positive! Multiply this number by the one we took out we get a negative product! 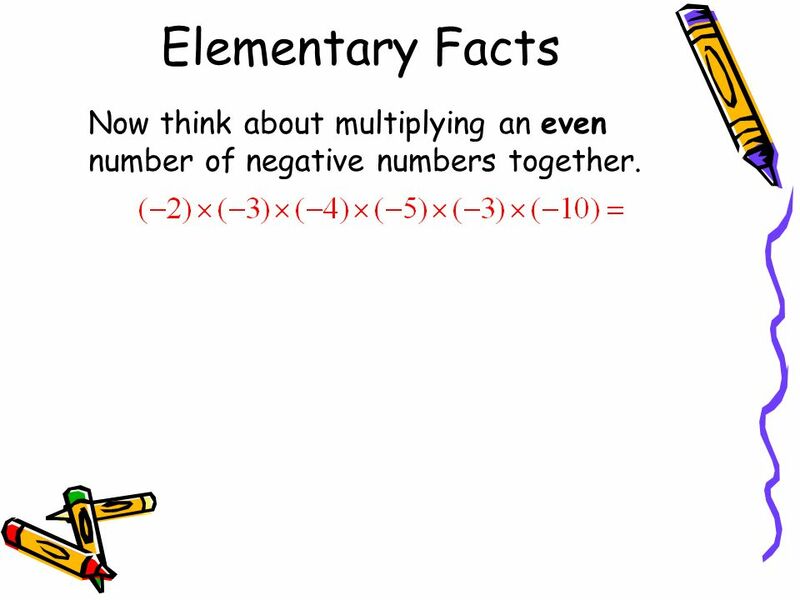 10 Now think about multiplying an odd number of negative numbers together. 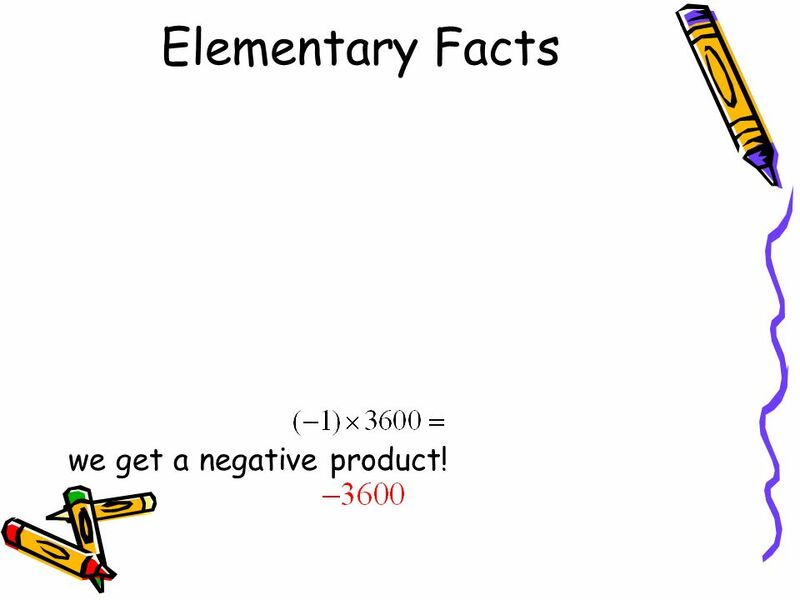 If we remove one negative number, the remaining even product must be positive! Multiply this number by the negative one we took out we get a negative product! 14 1. Determine the sign and write it down if it is negative. 15 2. 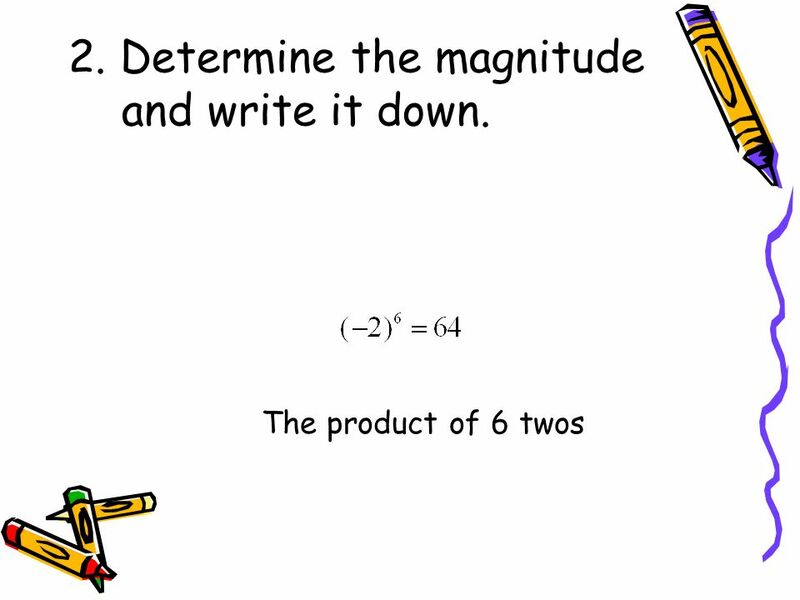 Determine the magnitude and write it down. 17 1. Determine the sign and write it down if it is negative. 18 2. Determine the magnitude and write it down. 20 1. 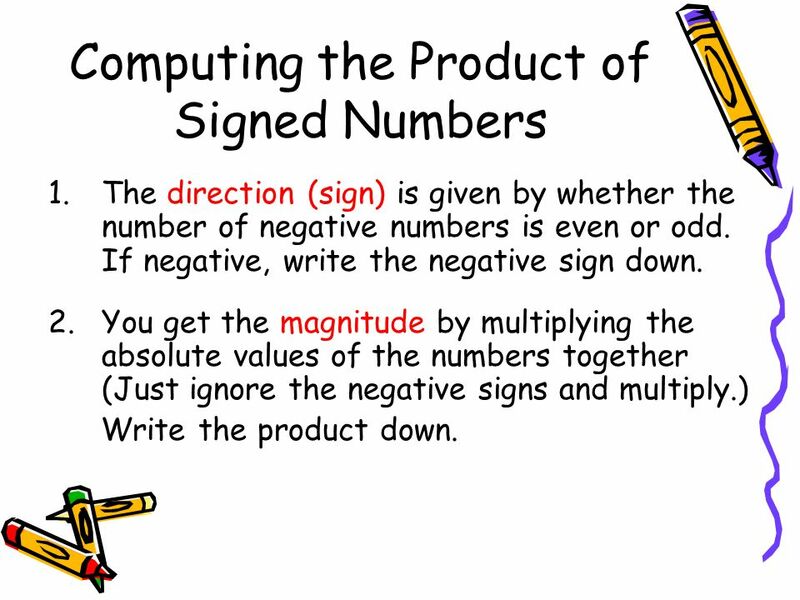 Determine the sign and write it down if it is negative. 21 2. 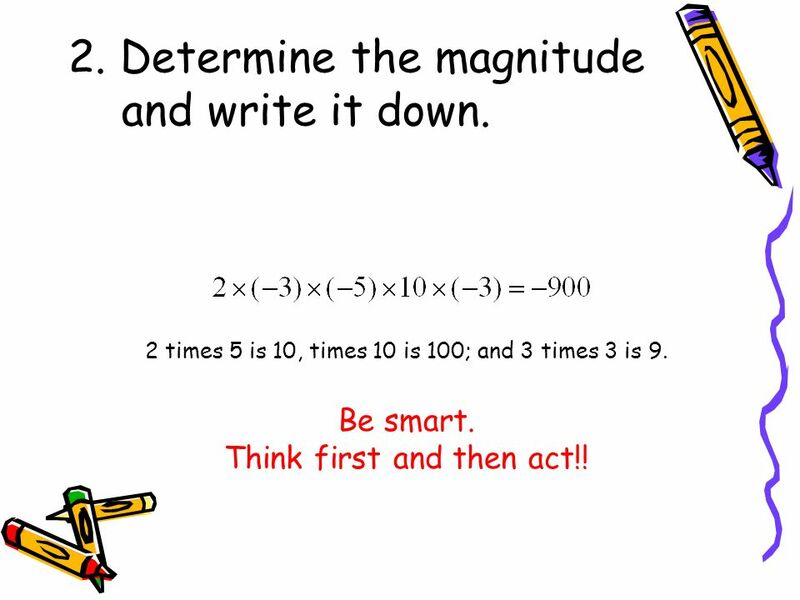 Determine the magnitude and write it down. 23 1. 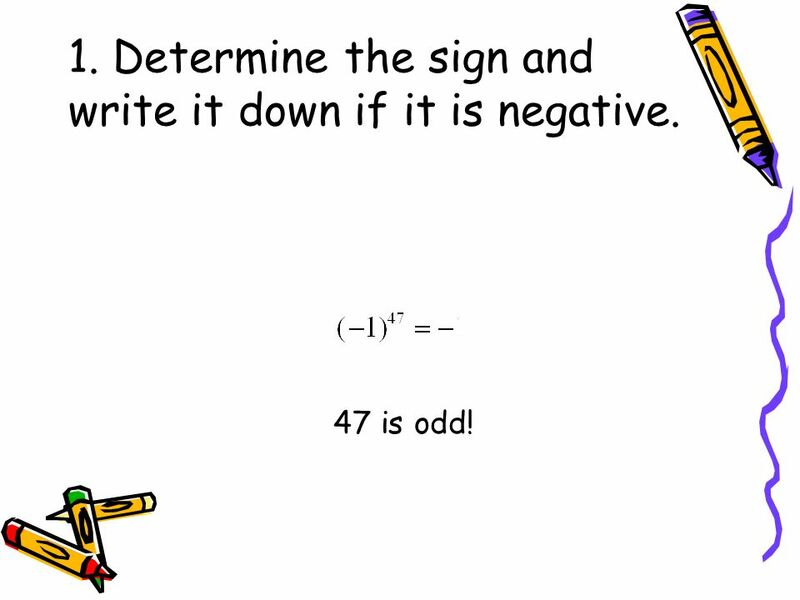 Determine the sign and write it down if it is negative. 24 2. Determine the magnitude and write it down. 26 1. Determine the sign and write it down if it is negative. 47 is odd! 27 2. Determine the magnitude and write it down. The product of ones is 1. 29 1. Determine the sign and write it down if it is negative. 6 is even! 32 1. Determine the sign and write it down if it is negative. There are 3 negatives! 33 2. Determine the magnitude and write it down. 2 times 5 is 10, times 10 is 100; and 3 times 3 is 9. Be smart. Think first and then act!! 35 1. Determine the sign and write it down if it is negative. 3 + 4 = 7 negative factors! 36 2. Determine the magnitude and write it down. Ignore the 1. The product of 4 twos is 16 ! Download ppt "The Integers Multiplication Algorithm. 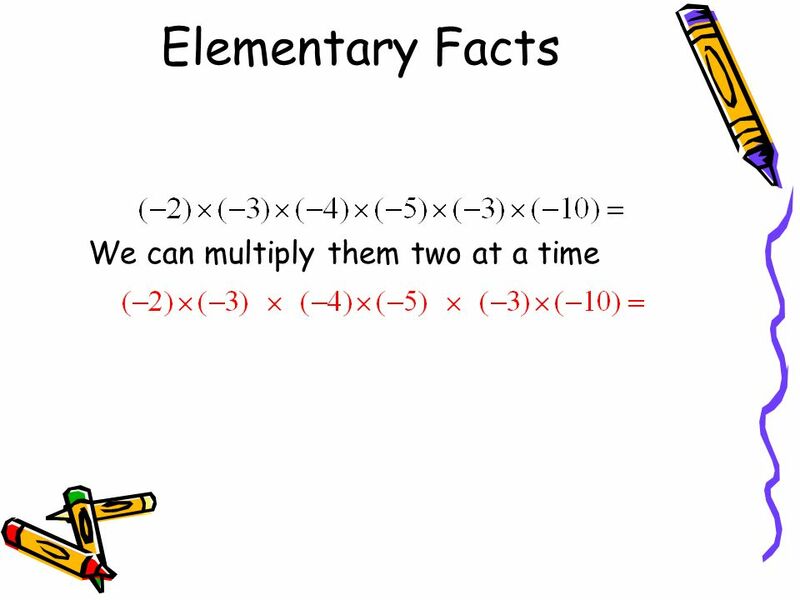 Elementary Facts Playing the MathGym-1D game you have seen three important facts: The product of two positive numbers." What two numbers will give you a product of 64 and a quotient of 4?  Which number is in exponential form: -10,, 10  Identify the Base of that number  What is the exponent in that number? - the number being multiplied. Objective: Learn to multiply and divide integers. ADDING, SUBTRACTING, MULTIPLYING, AND DIVIDING POSITIVE AND NEGATIVE NUMBERS BY: WILL, CODYR., AND AYLA. Warm Up 8/25 Find the next two numbers in the pattern: 12, 6, 24, 12, 48, …. Explain your reasoning.